Given your ability to win a single point in tennis, how likely is it you will win the set? If you want to win 9 out of 10 sets, by what margin do you need to dominate your opponent? It turns out that the answer is 4 out of 7 points. That’s right! You only need to score 4 out of 7 points (=57%) on average! Then you already win 9 out of 10 sets. Symmetrically, winning only 3 out of 7 points leads to losing 9 out of 10 sets. Let us give some other examples. Say you score 5 out of 8 points (=62.5%) on average. This already leads you to winning 79 out of 80 sets! By the time you manage to score 2 out of 3 points (=66.6%), you will win 699 of 700 sets. Incredible, isn’t it? This makes tennis a cruel game. Lose slightly more points than your opponent, and you will almost certainly lose the set. Why is this? It is twofold. First and foremost, repeating a deal at which one has a disadvantage is generally a bad idea. But this is exactly what tennis is about! Point after point is repeated until the disadvantage becomes apparent. Second, the structure of tennis with its points, games, and sets is increasing the disadvantage even further. It is not enough to score three points (e.g. 40-0), they are worthless if one does not manage to score the fourth point which brings home the game. If a tennis set was structured like a big single tiebreak (going to 24 points), the disadvantage would be less. Take the example above. Winning only 3 out of 7 points would normally lead to losing 9 out of 10 sets. In the big tiebreak version, one would lose only 8.5 out of 10 sets. We will dig into the math details in another post. Look at that graph. On the x-axis is the ability to win a single point. 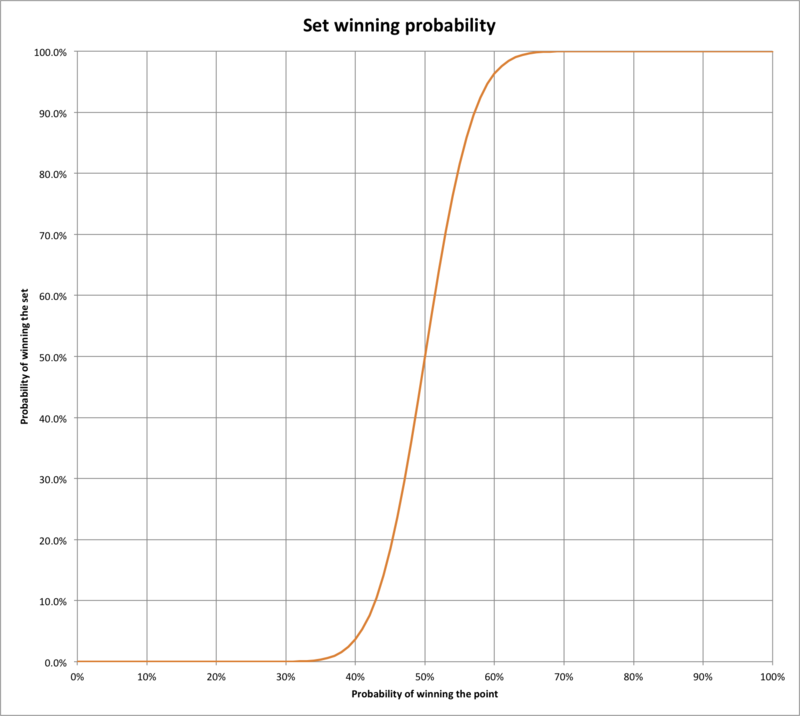 On the y-axis you can see the resulting probability of winning the set. For example, if you have the ability to score 50% of the points, then obviously you will win 50% of the sets. 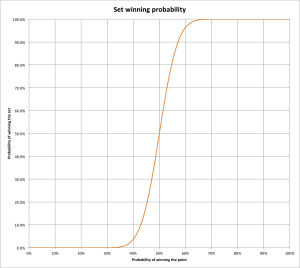 If you score 60% of the points, the graph shows more than a 95% set winning probability. From 65% onwards, winning the set is almost certain. Seeing all this clashes a little bit with reality. Isn’t it the case that most matches are much tighter than this graph would predict? Yes and no. Yes, because the whole consideration is only theoretical in nature. It assumes a constant point winning ability. This is not realistic for two reasons. First, there are serve games and there are return games. The server is usually at an advantage, so the advantage/disadvantage pattern switches every game. Second, there is psychology. For instance, players tend to get a re-break right after they have broken their opponent. And no, because we can observe many matches with very clear results. In these matches we can see very able professionals losing clearly despite them dominating many points. How to win a set? The answer is both simple and frustrating: Have a tiny little edge over your opponent! The good part is that the edge only needs to be tiny. The bad part is that you desperately need it. And you need it consistently over the whole set and match. Will you win 6-0 6-0?